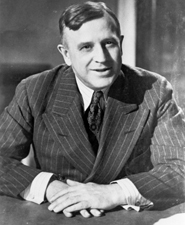 BROWN, Prentiss Marsh, a Representative and a Senator from Michigan; born in St. Ignace, Mackinac County, Mich., June 18, 1889; attended the public schools, and the University of Illinois at Urbana; graduated from Albion (Mich.) College in 1911; studied law; admitted to the bar in 1914 and commenced practice in St. Ignace, Mich.; prosecuting attorney of Mackinac County 1914-1926; city attorney of St. Ignace 1916-1928; unsuccessful candidate for election in 1924 to the Sixty-ninth Congress and for election in 1928 as justice of the Michigan Supreme Court; member of the State board of law examiners 1930-1942; elected as a Democrat to the Seventy-third Congress; reelected to the Seventy-fourth Congress and served from March 4, 1933, until his resignation, effective November 18, 1936; elected as a Democrat on November 3, 1936, to the United States Senate for the term beginning January 3, 1937, but was subsequently appointed to the United States Senate to fill the vacancy caused by the death of James Couzens for the term ending January 3, 1937, and served from November 19, 1936, to January 3, 1943; unsuccessful candidate for reelection in 1942; chairman, Committee on Claims (Seventy-seventh Congress); administrator in the Office of Price Administration 1943; resumed the practice of law in Washington, D.C., and Detroit, Mich.; chairman of the Mackinac Bridge Authority until his death; resided in St. Ignace, Mich., where he died December 19, 1973; interment in Lakeside Cemetery. Dictionary of American Biography; Brown, Prentiss M. The Mackinac Bridge Story. Detroit: Wayne University Press, 1956.